This series of activities melds art, science, and stewardship to protect the urban and wildland trees of the Bay Area. This is a collaborative project between University Extension specialists, 4-H Youth Development, charter schools, private advocacy groups, and the Forest Service, funded by a grant from the USDA-Forest Service's Pacific Southwest Research Station. As youth in 4-H clubs, after-school groups, library programs, and classrooms engage in 2013 and beyond, the map below will be populated with the locations of trees that have been adopted. 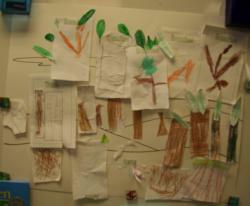 Check back again to see our urban forest grow! If you have pledged to protect a tree in your neighborhood, let us know! 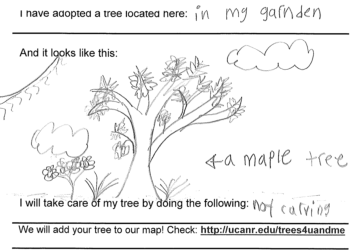 Fill out this simple form and we will mark your tree on our map. If you have a photo or drawing of your tree that you'd like to share, email us and we'll post it in our online gallery. Not moving firewood Not hurting or carving their bark Cleaning my shoes when I hike in the forest Keeping litter and non-water liquids away from their soil Telling someone if I think a tree is "sick" or being attacked by a pest. All of the above!